You can use the Oracle VM Server for SPARC software to assign an entire PCIe bus (also known as a root complex) to a domain. 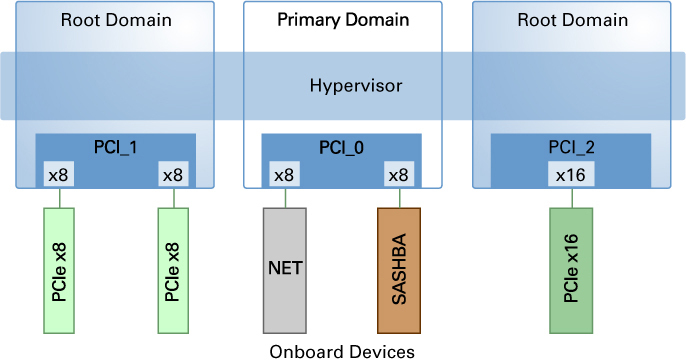 An entire PCIe bus consists of the PCIe bus itself and all of its PCI switches and devices. PCIe buses that are present on a server are identified with names such as pci@400 (pci_0). An I/O domain that is configured with an entire PCIe bus is also known as a root domain. The following diagram shows a system that has three root complexes, pci_0, pci_1, and pci_2. The maximum number of root domains that you can create with PCIe buses depends on the number of PCIe buses that are available on the server. Use the ldm list-io to determine the number of PCIe buses available on your system. When you assign a PCIe bus to a root domain, all devices on that bus are owned by that root. You can assign any of the PCIe endpoint devices on that bus to other domains. When a server is initially configured in an Oracle VM Server for SPARC environment or is using the factory-default configuration, the primary domain has access to all the physical device resources. Therefore, the primary domain is the only root domain configured on the system and it owns all the PCIe buses.